Choosing the right water bottle is important, since they can help you stay hydrated and keeping your favorite beverages as it should be. If you are in need for a great water bottle to accompany your activities, read our article below, because we are going to introduce you to two variants of Hydro Flask Water Bottle, which is the Hydro Flask Wide Mouth and Standard Mouth. 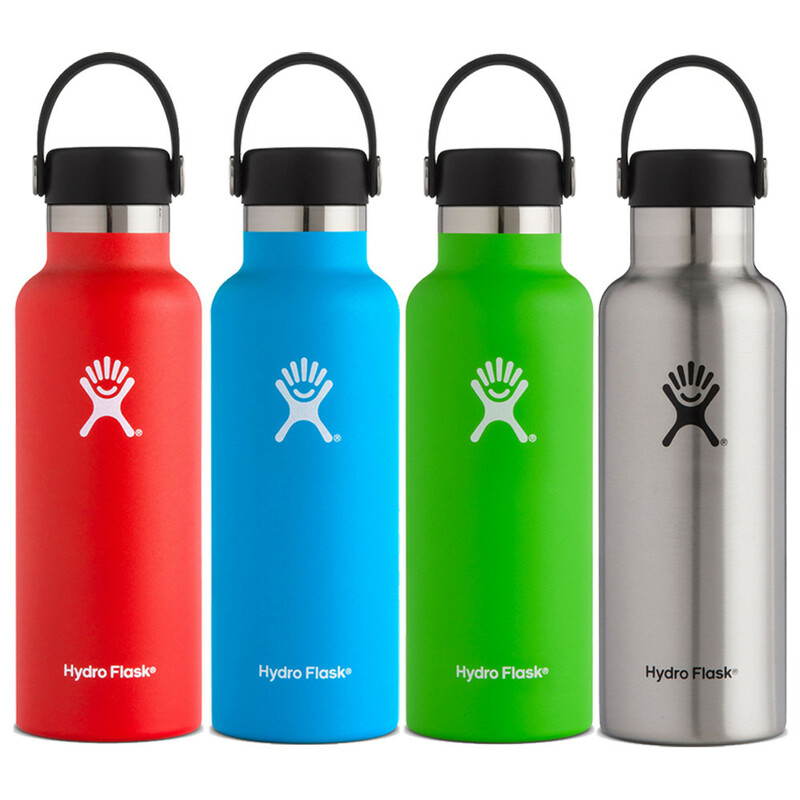 Hydro Flask is a brand of vacuum insulated water bottle brand manufactured by the same name company. The company was founded by Travis Rosbach and Cindy Morse in 2009, inspired by their experience when their water bottles becomes lukewarm after spend a day at the beach. Helen of Troy now owns the company; after it was acquired in 2016 for $210M. Hydro Flask now is based in Bend, Oregon. After the company reaches 1 million sales in 2011, they widen their market by offering the first-ever insulated growler for beer. Hydro Flask have won several award through the years and featured on many articles by various magazines. 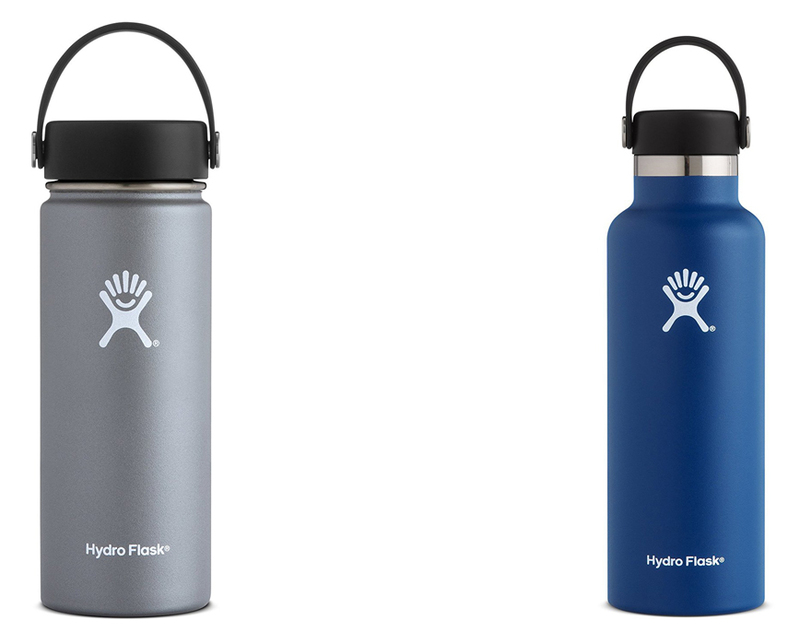 Hydro Flask now offers various products, not only insulated water bottle; they also offer Beer & Wine containers, Coffee Flask, Food Flask, and apparel. In the Hydration Bottles section, they have Standard mouth water bottle, wide mouth water bottle, and kids water bottle. Aside from those, they also have Tumblers, Large Capacity water container and some collectible limited editions. Even though they may sound different, you can use most of them to keep your water. Read our article on Hydro Flask vs Swell here. Hydro Flask Wide Mouth is just like how it sound, it is water bottle that has larger mouth compared to the standard version. The wide mouth version currently has 7 varieties differ by size and the cap types. Those sizes are, 18 oz, 32 oz, 32 oz with straw lid, WSL 32 oz, 40 oz, 40 oz with straw lid, and 64 oz. Most of them, especially, the 18 oz, 32 oz, and 40 oz are coming in a wide variety of colors, 11 to be precise. If you purchase one of them and need to change the lid or add an additional feature, such as straw or caps, you can also purchase them separately. The one we put in the picture for example is the 18 oz Hydro Flask wide mouth in graphite. This variety, recently added with 3 more color options, which is Flamingo pink, Blueberry blue and Olive. The wide mouth is initially designed, to ease you when carrying cold beverages with ice cubes in it, so the ice will easily slide into the bottle and keep your beverage colder. The 18 oz is the most popular size, because it is the perfect option for activities, such as morning hikes, afternoon ski lessons, or you may want to try taking it to accompany your evening campfire. Hydro Flask Wide Mouth product claims is it can keep ice water stay cold for 24 hours and hot beverages stay hot for up to 12 hours. Hydro Flask Wide Mouth is made with BPA Free material, with sturdy design, so you will not have to worry, your genetic makeup will altered by your drink. The construction is built from 18/8 stainless steel, which is a durable pro-grade stainless steel that will not transfer or retain flavors. It is also tough enough to be carried along in your adventures. The lid of Hydro Flask Wide Mouth lid is featured with Honeycomb Insulation to help keeping the temperature. The most important is the TempShield, which is Hydro Flask proprietary technology that consists of two layers to help protecting the temperature inside the bottle. The outer built has Hydro Flask Powder Coat to prevent sweating, so you can grip the bottle firmer even when used to contains cold beverages or water. Hydro Flask Standard Mouth is just how the name sound, it is water bottle that has standard mouth, which is smaller than the wide mouth we have talked above. 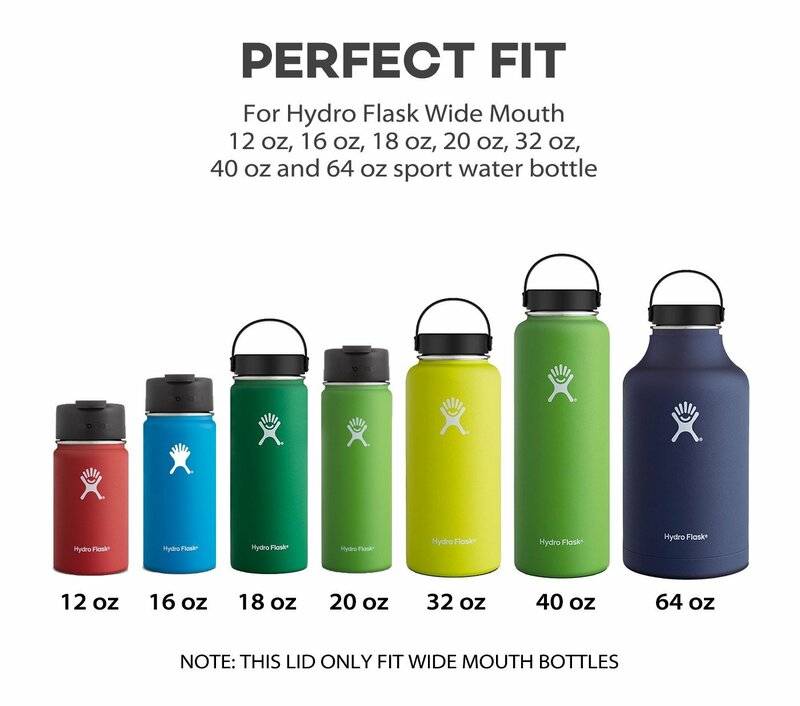 Hydro Flask Standard Mouth currently has 6 varieties, which differ by size and the type of lids or caps. Those sizes are 12 oz, 18 oz, 21oz, 21oz with sport cap, WSL 21 oz, and 24 oz. Most of them especially the 18oz, 21 oz, and 24 oz come with a wide variety of color. Just in case you want another kind of cap or lids, Hydro Flask also offers them that you can purchase separately. The example we used in our picture above is the Hydro Flask Standard Mouth 18 oz in Cobalt. This variety recently has additional colors in its options, which is Flamingo pink, Blueberry blue, and olive. Hydro Flask Standard Mouth can be used to keep both hot and cold water, so you can keep your fluid intake while you are doing your activities, whether you are heading to gym or taking a short trip across your town. The product claims is to be able to keep ice water cold for 24 hours and keep hot water stay hot for up to 12 hours. The outer body also coated with special proprietary powder to prevent it from sweating. Hydro Flask Standard Mouth is built with sturdy 18/8 stainless steel, which is durable pro-grade stainless steel that promised you it will not retain or transfer flavor and is very tough to accompany any of your journeys. The material used is also BPA-free, to erase your worry about your drink accidentally altering your genetic makeup. The lid of Hydro Flask Standard Mouth is featured with Honeycomb insulation to provide additional temperature control. The most important of them all is the TempShield technology, which is made with double wall, so it can protect heat or cold temperature inside the bottle for longer period. Now, let’s compare both Hydro Flask Wide Mouth and Standard Mouth. The most prominent different between Hydro Flask Wide Mouth and Standard Mouth is the width or diameter of the bottle’s mouth. Hydro Flask Wide Mouth has wider mouth diameter designed to slide ice easily when taking cold beverages, while Standard Mouth has narrower mouth diameter. Other difference is the sizes; Hydro Flask Wide Mouth sizes are mostly larger than the Standard mouth sizes. - DESIGN IN MIND: With it's easy-access wide mouth, the sleek design holds the same volume of liquid as other leading water bottle brands. Also, safety is top-of-mind, as the bottles are made out of non-toxic BPA-free plastics & 18/8 food-grade stainless steel. - SLIP-FREE GRIP: Unlike other leading water bottles, Hydro Flask has a powder coat, which gives you a solid grip. The Powder Coat works with the premium TempShield insulation, which prevents condensation from forming on the outside of the bottle, to give you exactly what you want in an everyday refreshment delivery system. - JUST THE RIGHT SIZE: Meets your everyday hydration needs in one container, all while keeping it piping hot or ice cold and fitting comfortable and conveniently in your hand or your vehicles' cup holders. The wide mouth aspect also fits most backcountry water filters. - INSULATION INNOVATION: The double-walled, vacuum insulated TempShield Insulation, the same technology used in all Hydro Flask products, will ensure that your beverage of choice maintains its temperature for many hours to come. Hot drinks up to 6 hours, and cold drinks up to 24 hours. - INSULATED, FLEXIBLE, AND BUILT TO LAST: Designed with stainless steel pivots and a flexible strap, this cap moves when you do. Plus, it’s made with Honeycomb Insulation to keep drinks cold up to 24 hours or hot up to 12 — no matter what the weather’s doing outside. - DESIGN IN MIND: Standard Mouth is ideal for sipping, while still accommodating ice cubes. Also, safety is top-of-mind, as the bottles are made out of non-toxic BPA-free plastics & 18/8 food-grade stainless steel. - JUST THE RIGHT SIZE: Meets your everyday hydration needs in one container, all while keeping it piping hot or ice cold and fitting comfortably and conveniently in your hand or your vehicles' cup holders and bicycle bottle racks. All in all, the option is up to your preference. In our opinion, if you are often or like carrying ice-cold water or hot beverages, it is better to opt for the wide mouth, since you can slide ice easily and drink hot beverages easily with wider mouth. But if you prefer bringing Standard water, we will recommend you the standard mouth.